Slate floors are a durable floor surface with a wide color and texture range. These hard-working stones have been used in entryways for more than 50 years with the stone returning to popularity frequently. 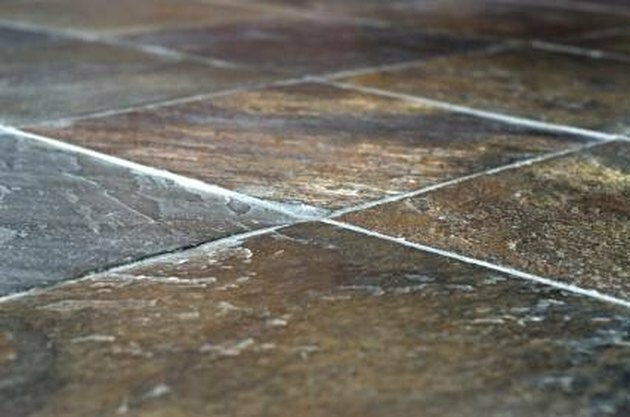 The treatment of stone, particularly on floors, has changed over the last few years as better products have entered the market for consumers. Sometimes, old finishes must be stripped off, so that the stone and grout can be thoroughly cleaned and all spots, marks and stains can be lifted. Remove any furniture, rugs and objects and vacuum your slate floor thoroughly to remove any grit or loose material. Wearing protection, liberally apply the acetone stripper to the grout lines using an old paint brush to presoak them. Scrub and strip the corners and along the edges by hand using your hand brush and the stripping product. Acetone is particularly good for stripping off waxy buildup and melting some sealer finishes. If your floor was sealed with urethane you may need to use Zip-Strip (follow their directions exactly as the product is aggressive and caustic). Use a 60 grit sandpaper for any residual sealer. Mop your floor with a neutral pH stone specific cleanser and rinse with distilled water. Dry your floor immediately. If you want to add a color enhancer product, this is when you should apply it. Vacuum your floor carefully to remove every bit of grit and dirt. Anything on the floor when you apply sealer will be sealed into the floor and grout. Apply your finish sealer per the manufacturer's directions. This may take several coats depending on your product. Allow each coat to dry thoroughly before applying the next coat.